Overall Beef Championship Judge:- Mr Jimmy Mulholland, Midtown Farm, Great Orton, Carlisle, Cumbria. 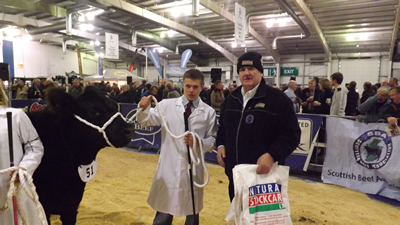 Native Classes Judge:- Mr Ian Neish, Craigeassie, Forfar. Galloways reign supreme in the native awards at Scotland’s National Winter Show, a pure bred Galloway bullock exhibited by Messrs M Telford and H Claxton, Newton High House, Newton, Stocksfield, Northumberland, won the best native award at the show which had moved to a Saturday. 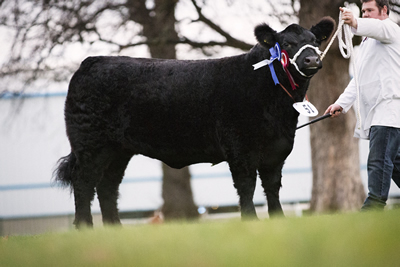 This April 2012 born bullock named Digby was bred at Kilnstown Farms Ltd, Kilnstown, Bewcastle, Carlisle and was purchased at the Society spring show and sale held at Castle Douglas. Digby is by the AI sire Orinocho of Over Barskeoch and out of Doreen 31st of Kilnstown. Malcolm and Helen also received the new prize of £250 from the Galloway Cattle Society, this is the first time it has been won since its introduction, this prize is for a Galloway if it wins the Best Native award at the show. Digby is full brother to Super Mario who won the native champion at the Scottish Winter Fair in 2010. In the steer class, sire by a Galloway, it was a cross Galloway which clinched the first prize, this dun coloured November 2012 born bullock called Onapromise was bred and exhibited by Mr Neil Slack, Plum Tree House, Newby Penrith, Cumbria. Neil is a regular exhibitor of commercial cattle and Onapromise is out of a previous show heifer Golden Promise which is a Charolais cross and by the AI sire and previous Highland Show champion Blackcraig Kodiac. The heifer class at the show is for heifer sired by any Native sire and it was a Galloway which took first prize, Nerys 1307 of Romesbeoch exhibited by J & S Ross, Romesboech, Shawhead, Dumfries was a stylish winner. This September 2011 born heifer is by their senior stock sire Kirkmabreck Nimrod and out of the show cow Doon of Nerys 42nd. Also at the show was our Young Handlers competition, this competition now in its second year, was very well supported with 7 young members taken part. The competition was sponsored by Nith Valley Construction, Natural Stockcare Ltd, Craig Wilson Ltd, Ayr, Farm Stock Ltd (Scotland). First in a very strong competition was Hayden McEleavey Ross, Romesbeoch, Shawhead, Dumfries he also received the handsome trophy kindly donated by Mr Billy Melrose. Seconded was last year’s winner Miss Sophie Harvey, 100 Buchanan Street, Balfron, with Sophie’s sister Beth third and brother Jamie forth. The Winter Fair has its own Young Handlers competition and it was young McKenzie Ross, Romesboech who received first prize in the 12 years old and under competition. Well Done. Also awarded at the show was the Lew Watson Memorial Trophy, this award is for the best two animals, shown by one exhibitor was won by Messrs P & EB Robson, Middle Horselyhope Farm, Waskerley, Consett, Co Durham, with two entries, one bullock, (Will I Am) and one heifer (Candy Girl) they where purchased from Kilnstown Farms Ltd. Both animals are Limousin crosses and out of Limousin x Salers x Galloway cows. 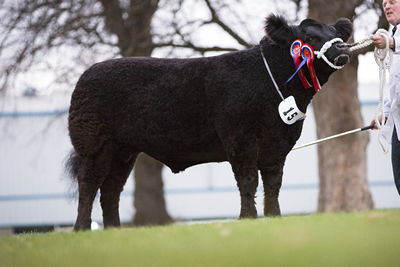 This stylish pair is destined for the National Beef Association Beef Expo at Hexham in May. 4th Harvey Cattle, 100 Buchanan Street, Glasgow, Ben Lomond Vimto, sire Vom Bechtelsbery- Efendi.